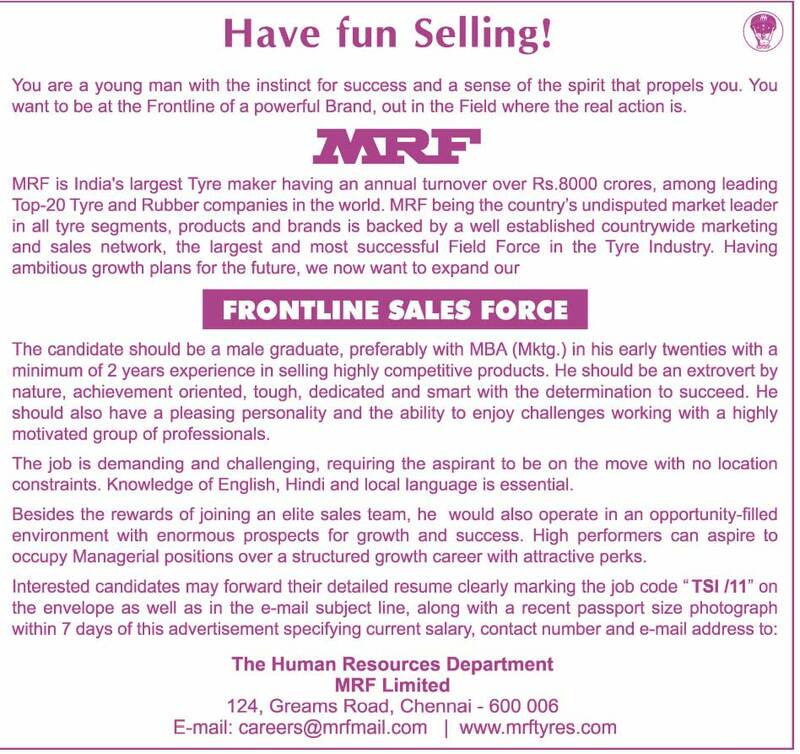 MRF is India's largest Tyre maker having an annual turnover over Rs.8000 crores, among leading Top-20 Tyre and Rubber companies in the world. 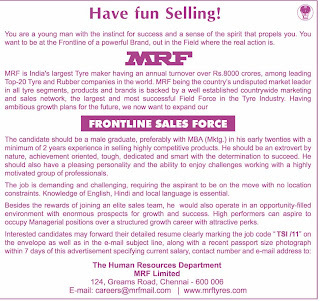 MRF being the country's undisputed market leader in all tyre segments, products and brands is backed by a well established countrywide marketing and sales network, the largest and most successful Field Force in the Tyre Industry. Having ambitious growth plans for the future. The candidate should be a male graduate, preferably with MBA (Mktg.) in his early twenties with a minimum of 2 years experience in selling highly competitive products. He should be an extrovert by nature, achievement oriented, tough, dedicated and smart with the determination to succeed. He should also have a pleasing personality and the ability to enjoy challenges working with a highly motivated group of professionals. The job is demanding and challenging, requiring the aspirant to be on the move with no location constraints. Knowledge of English, Hindi and local language is essential.